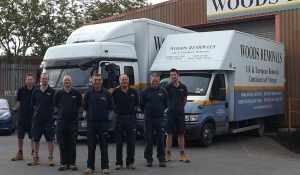 Removals Company Wareham, Woods Removals Wareham Ltd.
Moving house in or out of Wareham is easy when you choose Woods. We’ve been doing what we do for 140 years and this amount of experience all adds up to a quality service. We know the pitfalls of moving and we also know how to avoid them. What we offer you is a stress-free, well-planned and structured move, with additional services such as full packing and unpacking and storage. Not every removals company in Wareham comes up to our standards. We know the area extremely well so precious little time gets wasted on the road, trying to find locations. We’re BAR-certified (British Association of Removers) which means you are guaranteed certain standards and protections, giving you complete peace of mind. With every additional year we’ve been going, we’ve devised better and better ways of moving our clients into their new homes while diminishing their worry and stress at every turn and critical juncture. To get matters started, our estimator will visit you and make thorough notes, covering every last detail of your move. After this, a clear and easy-to-follow quotation will be issued to you and, upon your agreement, your move will be carefully devised so that nothing is left to chance. Our skilful packers know exactly what they’re doing. They come equipped with all the latest packaging materials and they know how to move difficult items like grand pianos, valuable artworks and fragile antiques. They’ll ensure that everything is fully protected before being loaded safely into our vehicles, ready for transit. It’s details like this that separate us from other removal companies in Wareham. Do you need storage in Wareham? We’ve got great facilities; safe, secure and spotless, available for both short- and long-term at highly competitive rates. Further to that, we also offer first-rate commercial/business relocations (including IT migration), European moves and international moves. A complete complement of services, all of them notable for the care and quality we bring to them. Don’t entrust your move to a fly-by-night, here-today, gone-tomorrow outfit when you can come to the best.